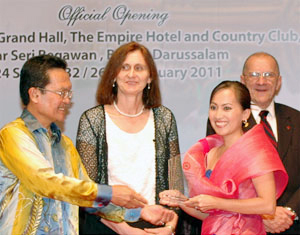 The Southeast Asian Ministers of Education Organization honoured the winner of the 2010 SEAMEO-Australia Press Award during the 46th SEAMEO Council Conference on 27 January 2011 in Brunei Darussalam. The SEAMEO Council President and Minister of Education, Brunei Darussalam, H E Pehin Abu Bakar Apong, presented the plaque of recognition to Ms Melclaire S Delfin, Senior Correspondent, GMA Network, Inc., Philippines. On its eleventh and final year, the 2010 SEAMEO-Australia Press Award focused on the theme "Innovation in Education" which made way for effective reporting and documentation of new ideas and approaches in providing education for all. Ms Melclaire Delfin's article titled "Palengskwela: Bringing the school to the market" reported on a system of learning for out-of-school youth and adults in the Philippines who did not finish basic education and do not have time and opportunity to go back to formal school. The Alternative Learning System is implemented by the Department of Education, Philippines and is an excellent concept that is easily adoptable and relevant to many parts of Southeast Asia. As part of her prize, Ms Melclaire Delfin will undertake a three-week internship at the Melbourne Age Newspaper in Melbourne, Australia. Ms Marie Grealy, Counsellor (Education), Australian Embassy in Jakarta, Indonesia delivered a speech on the SEAMEO-Australia Press Award and announced the winner. SEAMEO and the Australian Government coordinated to make this recognition possible through the Department of Education, Employment and Workplace Relations in Australia and the Australian Education International of the Australian Embassy in Bangkok, in collaboration with the University of Melbourne and its Asia Link Centre. expresses thanks to all journalists, student journalists and education communicators who participated in the 2010 SEAMEO-Australia Press Award and announces the 2010 winner. 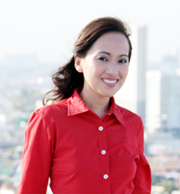 "Palengskwela: Bringing the school to the market"
The following are the top 14 articles. Click on the title to read the articles. 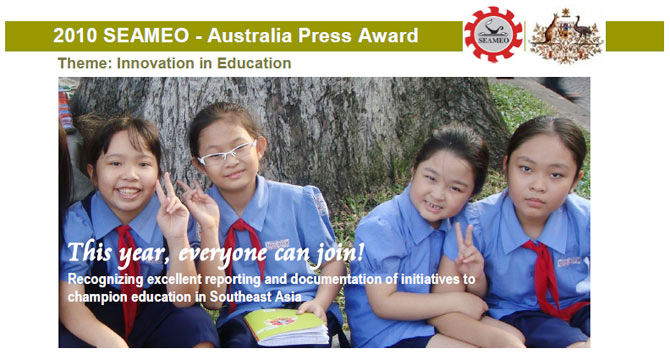 The Southeast Asian Ministers of Education Organization (SEAMEO) announces the 2010 SEAMEO-Australia Press Award Contest under the theme "Innovation in Education". We are proud to invite you to join this multinational contest that encourages reporting and documentation of new and bright ideas and practices that improve education in your local community, your country or the Southeast Asian region. The contest was initiated 10 years ago and continues to expand and improve with each successive year. In keeping with our commitment to expand each year, the Contest Rules have been extended to include not only professional journalists, but also student journalists, and education communicators. Also, Contest Articles may include both previously published and never-before-published articles. For the past 10 years, the SEAMEO-Australia Press Award has recognized excellent coverage of education issues by journalists in Southeast Asia. Now on its eleventh year, the Competition gives greater opportunity for more education advocates to write and promote great initiatives on education in Southeast Asia. SEAMEO and the Australian Government coordinate to make this recognition possible through the Department of Education, Employment and Workplace Relations in Australia and the Australian Education International of the Australian Embassy in Bangkok, in collaboration with the University of Melbourne and its Asia Link Centre. This year's Contest Theme is "Innovation in Education". It makes way for effective reporting and documentation of new ideas and approaches in the different and combined facets of education, science and culture. Entries could present initiatives that have been conducted and proven effective in Southeast Asia. Articles could also introduce fresh ideas that could later be implemented in other places within Southeast Asia, particularly with the help of or through SEAMEO. News or feature articles should present lesson plans, school projects, teaching or learning theories and/or methodologies, administrative policies or other activities that have or could be proven effective in Southeast Asia. Unique cross-border or multinational education projects. The theme supports SEAMEO's commitment to promote regional cooperation in education, science and culture in Southeast Asia since its establishment in 1965. More information about SEAMEO can be found here. Dynamic institutional and governmental collaboration and/or cross-border partnerships that link students, teachers, schools or other education organizations together and that focus on education projects that can be reproduced in other countries. Extra consideration will be given to articles that address issues or initiatives that SEAMEO can use, duplicate, or implement in the near future as a SEAMEO project. The term "Education Communicators" means a person who is a distributor of news, information or knowledge regarding education. Such a person may produce or substantially contribute to education newsletters, blogs or websites; or may host a TV or radio program, the main thrust of which is education; or the person may be the creator or host of an educational blog or website. A Contestants must be a national of a SEAMEO Member Country. The applicant must be at least 18 years old by the Contest deadline. The contest deadline is 1 December 2010 at midnight. All entries must be submitted by that date and time. Download here and complete the Contest Application Form. Last day for submission of entries is 1 December 2010. The Contest winner must be willing and available to participate in and complete the three-week journalism internship at Melbourne Age Newspaper in Melbourne, Australia, by end of December 2011. The Contest Article should be an original article that has been created by the Contestant and should be between 750-1000 words. Although the article may have been previously published in a print format, it remains eligible to compete in the Contest, as long as it was previously published under the name of the Contestant. The article may be written in English or any Southeast Asian language. If it is written in any language other than English, the Contestant shall, at his or her own cost, provide to the Contest Organizers a translation in English that is substantially equivalent to the text of the original non-English language version of the Contest Article. However, it is not necessary that the translation be done by a certified or official translator. The translated copy must be submitted at the same time the original non-English Contest Article is submitted to the Contest Organizers. By submitting an article, the author gives SEAMEO permission to publish it. A Contest Article and/or any translated versions thereof, at the discretion of the Contest Organizers, may be published in local, national or international print media. Consequently, each Contestant, by submitting the Contest Article, agrees to allow the Contest Organizers to print or reprint the article. For Articles that have been printed prior to entry into the Contest, the Contestant affirms that he or she has the authority to authorize the Contest Organizers to reprint the Contest Article. Both published and unpublished articles are eligible to compete. For a published article, the author must give SEAMEO permission to reprint it. For an unpublished article, the author must certify that it is an original material created by the author and not previously published in any format. There can only be one Contestant per Contest Article. Additionally, a Contestant can only submit a single Contest Article (except where the original non-English version has been translated into English), in which case both versions will be submitted and treated as a single Contest Article. Each Contest Article shall be presented on size A4 plain white paper, with about a 2.5cm border on all four sides. Lines should be double-spaced. Each Contest Article submitted in English shall be typed in Times New Roman or Arial, in size12 pt font. Contest Articles submitted in Southeast Asian languages (such as Thai) that do not use Western-style fonts may be neatly handwritten or typed in a font that contains easy-to-read characters. Each page of a Contest Article shall be numbered sequentially and individually, using Arabic/Hindu numerals (1, 2. 3, etc). 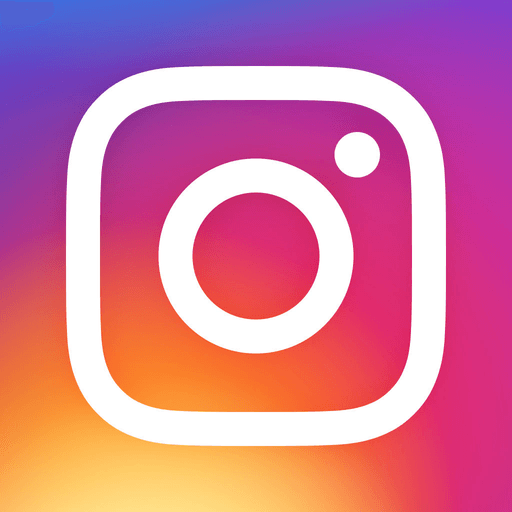 Except for the transmission email or cover page, the Content Pages shall NOT include personal identifying information about the Contestant, such as but not limited to her or his name, address, phone number or email address. The Contest Winner will be notified by the SEAMEO Secretariat including the details of the awarding ceremony. Each Contestant agrees that the Contest Rules and Regulations that govern this contest can be modified or amended without prior notice, by the Contest Organizers. Employees who work for the SEAMEO Secretariat and the SEAMEO Regional Centres are not eligible for this Award. The Contest Winner will receive a round-trip economy air ticket from his/her country of citizenship to Melbourne, Australia, for a three-week internship at the Melbourne Age Newspaper, including pre-determined accommodation and stipend. The Contest Winner will receive a round-trip economy air ticket from his/her home country to the 46th SEAMEO Council Conference in Brunei Darussalam, including pre-determined accommodation and stipend. The Contest Winner will be awarded a plaque of recognition at the SEAMEO Awarding Ceremony at the 46th SEAMEO Council Conference in Brunei Darussalam in January 2011, and honored before top educators of Southeast Asia and their guests. The Selection Committee consists of senior journalists and education experts from Southeast Asia and representatives from UNESCO, the SEAMEO Secretariat, SEAMEO Regional Centres, and the Australian Embassy in Bangkok. The Selection Committee shall pre-screen the Contest Articles to determine (1) whether they meet the Contest Rules and Regulations and (2) whether the quality and substance warrant being passed along to the Judges Panel. Each member of the Judges Panel will review the Contest Articles that make the final cut individually and separately, using a "blind review". The Judges Panel will not know the name or other personal information about the contestant until all decisions have been made and a final Contest Winner has been announced. Any personal identifying information on the content pages of the article shall be removed by the Selection Committee prior to being submitted to members of the Judges Panel. Entries should be submitted by email to secretariat (at) seameo.org on or before the deadline. Last day of submission of entries is on 1 December 2010.
and SEAMEO Regional Centre in your country.